It was 101 years ago this Christmas season that something miraculous happened along the Western Front. After months of bitter fighting, soldiers on both sides gathered in no-man’s-land in a spontaneous show of peace and goodwill. Here’s what happened on that historic day — and why it marked the end of an era. In December 1914, the war was entering into a new phase: an extended siege fought along static trenches stretching along a 750 km (466 mile) front. During the previous four months, soldiers were killed at a horrendous pace, and with no end of the war in sight. But during Christmas, things suddenly became quiet — at least for a little while. Commonwealth troops fighting in Belgium and France started to hear odd sounds drifting from across no-man’s land; German soldiers were singing Christmas carols like “Stille Nacht, Heilige Nacht” (“Silent Night, Holy Night”). Allied troops applauded and cheered, shouting out for more. Soldiers on both sides began to sing in unison, trading verses in alternating languages. Germans shout over to us and ask us to play them at football, and also not to fire and they would do likewise. At 2am (25th) a German Band went along their trenches playing “Home Sweet Home” and “God Save the King” which sounded grand and made everyone think of home. Then, very cautiously and with great courage, unarmed German and Allied soldiers climbed out of their trenches to stand atop their defenses. Near Neuve Chapelle, an Irish soldier brazenly walked across no-man’s-land where he was greeted not with machine gun fire, but with a cigar. His act of bravery inspired others in his troop to do the same. Similar scenes were repeated elsewhere as soldiers walked towards each others trench, or to simply meet half-way. And when they met, the servicemen exchanged Christmas greetings as best they could. They began to give each other gifts in the form of mementos, cigarettes, and foodstuffs like bully beef, wine, cognac, black bread, biscuits, ham, and even barrels of beer. They showed each other photographs of family and loved ones back home. Some soldiers even started to play football with makeshift balls. A reenactment of the 1914 Christmas Truce produced by Sainsbury in partnership with the Royal British Legion. Remarkably, similar scenes occurred at dozens of distinct points from the North Sea to the Swiss border. Nonetheless, Col Laurie...gave orders not to fire on the enemy the following day, unless they fired first. At 8.30pm on Christmas Eve, he signalled brigade HQ: “Germans have illuminated their trenches, are singing songs and are wishing us a Happy Xmas. Compliments are being exchanged but am nevertheless taking all military precautions.” No shots had been fired since 8pm, he added. The truce also allowed the troops from both sides to collect and bury their dead, which was no small matter. Fewer things were more jarring to a serviceman than knowing that the remains of fallen comrades were still out in the open. But the truce was not honored everywhere. In an incident that only recently came to light, three soldiers — two British and one German — were killed despite the temporary peace. Contrary to most accounts, it was not quiet and calm in all sectors along the front line separating Allied troops from the Germans. At least 250 servicemen died on Christmas Day, including 149 Commonwealth soldiers, though the majority of them succumbed to previously-inflicted wounds. There was a great deal of commotion going on in the German front line 150 yards away. After a few moments there were lighted objects raised above the German parapet, looking like Chinese lanterns to us. The Germans were shouting over to our trench. We were ordered to open rapid fire which we did. The Germans did not reply to our fire and carried on with their celebrations. They ignored us and were having a very fine time indeed and we continued in our wet trenches trying to make the most of it. They did make overtures but the Guards Brigade had the highest discipline in the army and you couldn’t expect them to fraternise at all and that is why we were ordered to open fire. Apparently regular troops did respond to their overtures and engaged in this truce. I greatly regretted it afterwards because it would have been a good experience. So, with some stretches of the front in a state of temporary truce and others not, soldiers were placed in great peril. In Lane’s sector, a German sniper shot Private Percy Huggins who was serving sentry duty at a forward listening post a mere 20 yards from the enemy’s position. In retaliation, Sergeant Tom Gregory assumed his position, managed to locate the sniper, and took him out. A few moments later, while searching for more snipers, he himself was shot and killed by a second German marksman. Interestingly, the event inspired the British to “study the art of sniping,” who soon after added the “tactics of the hunter” to the science of shooting. 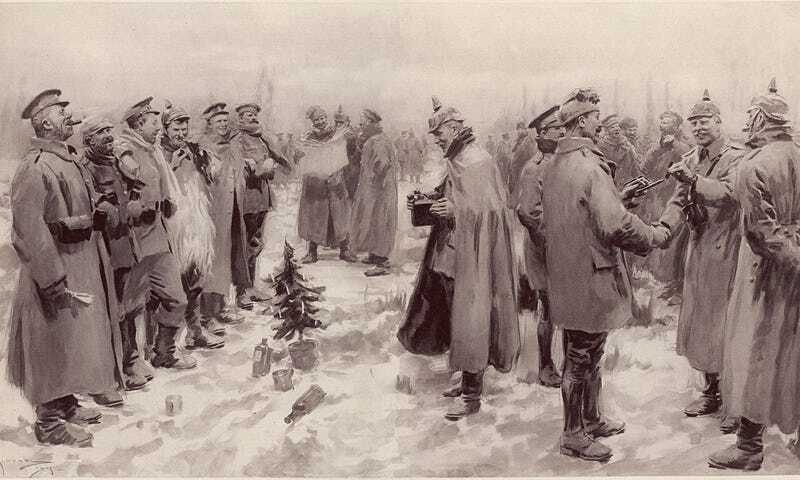 Such was the Christmas Truce of 1914. In some places, it continued for more than a day. But the generals, when they learned of it, made sure it would never happen again. And despite sporadic attempts in later years, it never really did. Back to business. 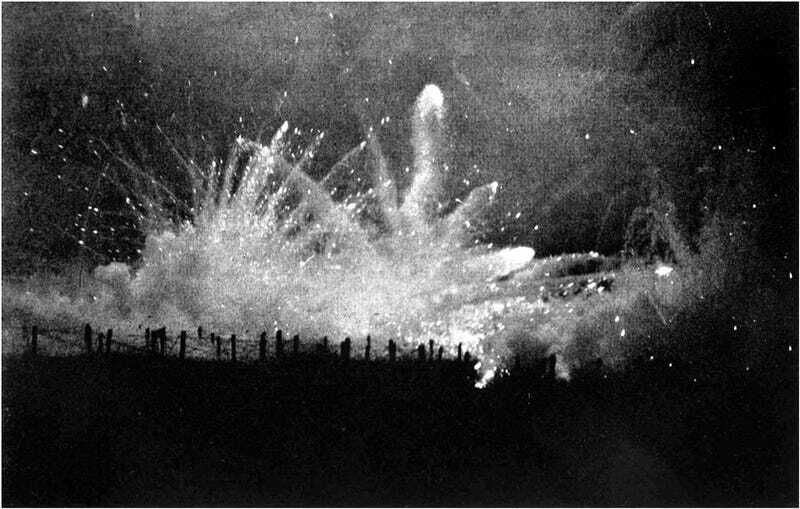 A German artillery barrage at Ypres. A century later, it’s easy to dismiss all the remembrances and tributes as being overly sentimental and maudlin. What’s often forgotten, however, is what the temporary peace represented in the larger scheme of things. There’s a very good reason why a truce never happened again in this war and in subsequent wars — and much of it had to do with the changing nature of military strategy, the changing role of soldiers and how they engaged with the enemy, and the high stakes involved for industrialised nations embroiled in a war without compromise. Moving forward, politicians and military leaders could no longer tolerate such fraternizing in consideration of mass armies existing in an age of revolutionary fervor. It suddenly became an issue of control. 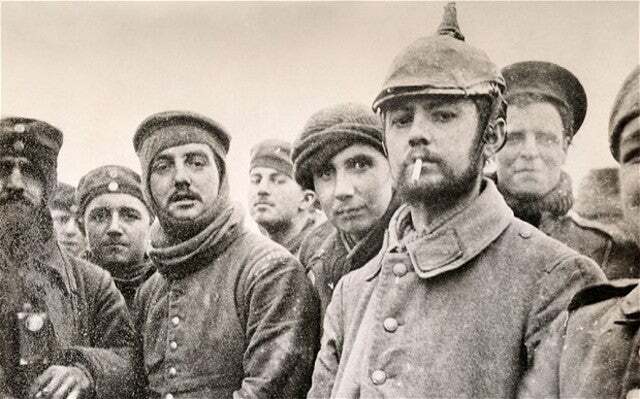 The Christmas Truce of 1914 can also be seen as the last gasp of the romantic 19th Century, the final gesture of an era that featured “gentlemanly” soldiering and gallant heroes who could confront their adversaries face-to-face. Professional soldiers in WWI were replaced by recruits with no sense of military tradition. 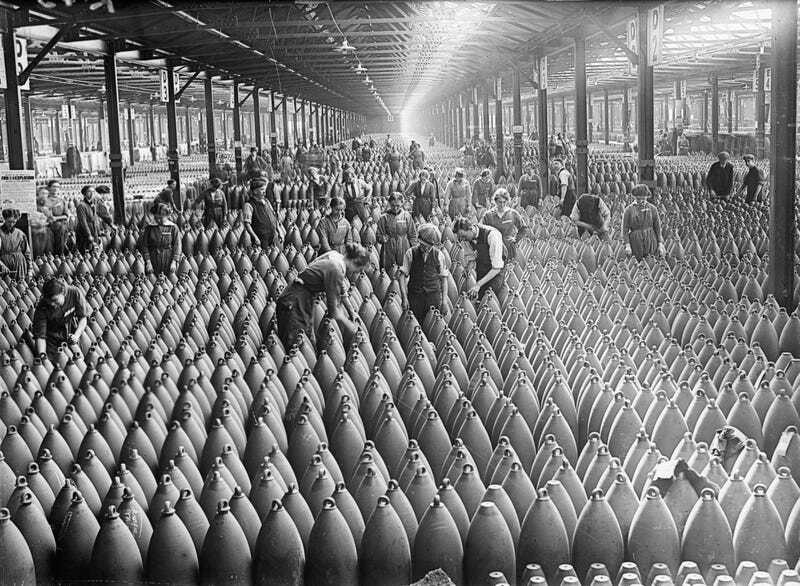 Battlefields, like the factories back home, had turned into industrialised workplaces. Wars were no longer defined by movement and decisive battles. Instead, it became a battle of attrition where armies of millions would be pitted against other armies of millions. Meanwhile, the multitudes back home rallied the home front to provide material support with their industrial might. Indeed, war started to become a vengeful and highly impersonal activity. And unlike the Second World War, in which ideological motivations were evident to nearly everyone, the Great War was for many a strange, wasteful, and senseless conflict.